A pure white shed-like structure sandwiched between two brick buildings is one of several installations that have popped up along a main thoroughfare in Columbus, Indiana. The series of Washington Street Installations was created for the Exhibit Columbus festival, which opened last weekend in the city – an unlikely mecca for modernist architecture that was recently used as the subject of a movie by director Kogonada. For the project, curated by local designer Jonathan Nesci, five international galleries were asked to choose a designer or studio to create a temporary intervention that responded to the busy street. Snarkitecture inserted a white gabled-roof shelter in an alleyway between two existing brick buildings. 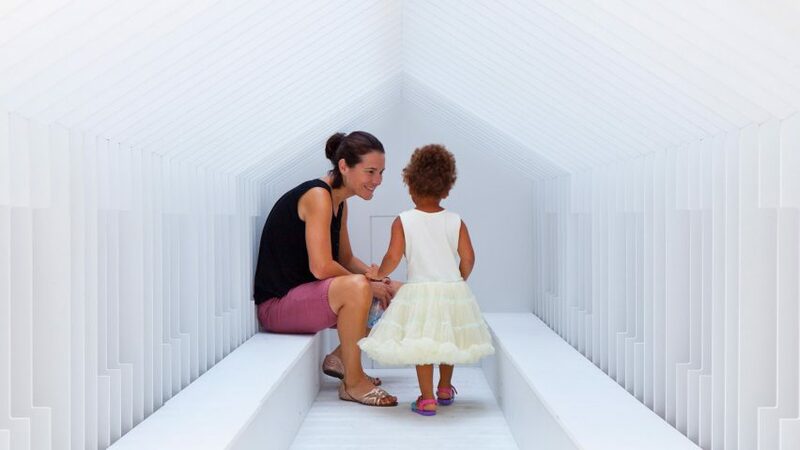 Chicago's Volume Gallery selected New York-based Snarkitecture, which inserted a white gabled-roof shelter in an alleyway between two existing brick buildings. The Playhouse is designed to look longer than it actually is, and has benches along its two sides for members of the public to use. "Using forced perspective to create the illusion of unexpected depth, Playhouse is an immersive environment open to all, but only fully able to be explored by children due to the diminishing scale," said the project's organisers. Amsterdam duo Formafantasma was picked by London materials company Dzek. Their Window to Columbus installation made from glazed volcanic brick incorporates a vitrine, and is located outside the Heritage Fund building. The installation incorporates a window that will act as a "mini museum"
"Over the course of Exhibit Columbus, this window will serve as a mini-museum, sharing rarely seen documents, architectural models, and other local historical gems curated by Formafantasma and Tricia Gilson of Columbus' Architectural Archives," the organisers said. Cody Hoyt, a Brooklyn designer chosen by New York-based Patrick Parrish Gallery, has used coloured concrete tiles to brighten up the street corner at Seventh and Washington. The locally produced, triangular bricks mimic the colours of Alexander Girard-designed seat cushions at the Miller House and Garden – architect Eero Saarinen's famous residence in the city. "Hoyt [has created] a vibrant motif that invites visitors to imagine new ways to use this corner as a platform for events and happenings," said the team. For the final two interventions, Danish studio Pettersen & Hein has added a range of colourful concrete street furniture, while Mexico City's Productora has designed nine circular seats that fit around existing architectural elements along the street. Pettersen & Hein was put forward by Copenhagen gallery Etage Projects, and Productora's involvement was Brussels-based Maniera's idea. Exhibit Columbus runs until 26 November 2017. Other installations created for the event include a circle of stones arranged across a field by Aranda\Lasch. Photography is by Hadley Fruits.